Amy Rose’s Utility Room is to performing artists what a life drawing class is to visual artists. With a focus on developing and maintaining a relevant core practice, it explores presence and play whilst expanding the performer’s took kit and performance making range through movement and vocal improvisations, tasks, exercises and games. This is a class where actors, dancers, live artists, puppeteers and other performance practitioners can develop their craft in a friendly yet professional atmosphere. 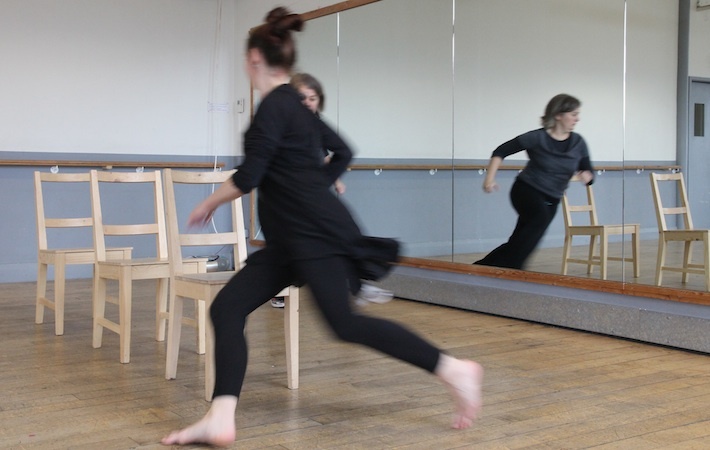 The approach is influenced by the notions of play, pleasure, and complicity from the physical theatre teachings of Jaques Lecoq and Philippe Gaulier as well as the improvisational performance practices of Al Wunder, Andrew Morrish, Action Theatre and Brenda Waite’s Flummery Room. I find it so hard to stay creative, especially working by myself a lot, so have found the sessions amazingly fun and inspiring, and actually they really reminded me why I do what i do. One of the best classes I have taken for a very long time. The lessons were planned, themed and grew as the sessions unfolded. The atmosphere was supportive and reassuring. A great class with a superb teacher who enabled everyone to learn and grow at their own pace. What a delight! A great sense of freedom aligned to creative purpose is hard to teach. It can be learned but not taught. Amy lives the tenets of what she shares with others. That comes through in a class and it is refreshing and honest. The “unlearning” of movement is equally as important as the learning of movement and performance. Where else could you stick a piece of tape on your nose and learn how to get so much out of that experience? Brilliant!